A great option to cover your bases! The avocado oil range offers something for everybody! I definitely have my favourite products (shampoo and body lotion in particular), but the fragrance contained in all products was quite delicious, and the products offer exactly what they say - products to restore moisture to your hair and/or skin. I will continue to use in future! Overall, I’m really impressed with this whole range. All of the products did what they said they would, it’s all left my skin and hair feeling great, and it all works well together. The scent on all products is not strong, and I have enjoyed this! Will definitely be repurchasing the shampoo, conditioner and moisturiser! I received this range to review, and was excited when it arrived. I love the packaging, and the pumps make it so easy to use in the shower. It has a gentle scent, not overpowering which is good. A small amount goes a long way, so I feel this is a good value for money product. Overall a great range and value for money. Thank you so much Beauty Review for selecting me to trial and review this product range. I really love the concept of no Parabens, SLES, Silicones or artificial colourants but am confused why an SLES would be added to a shower gel when it’s not included in thr shampoo. The packaging shows that Schwazkof are trying to be more environmentally conscious by using 25% recycled plastic in their bottles while also creating a recyclable bottle. There are some great products in the Avocado Range but I think if I were to continue using this brand then I’d mix and match between ranges to suit my needs better. Overall I liked the fragrance, the concept and the delivery. It’s refreshing to see big companies being willing to try something new to meet market demand for healthier more sustainable personal goods. Tips: Look at mixing and matching between the different ranges to tailor make toiletries which suit your personal needs the best. I'm so lucky to have been selected to review the nature box avocado oil range. It has definitely given me a new range to covet and I will continue its use. For something so affordable it really has made my hair and skin feel great. The shine, texture and overall feel of my hair has improved as well as a significant decrease in split ends over the 2 weeks of use. I get dry skin in some areas and with being 31 weeks pregnant my skin can be sensitive at times, the body wash and moisturizer has worked well for my skin and made it feel softer and more supple. It was strange using products that lack scent as this is normally something I use as a main point of sale but the way my hair and skin feels out weighs the need for fragrance. I feel the only thing I would improve is the packaging as it seems not so eye catching and slightly busy. Thanks for the opportunity to review this avocado collection BR! I really enjoyed using this range and learning more about Oils in products, I liked most products and there was nothing that I wouldn't happily use again. Loved the packaging and how it's vegan. The scent I didn't love, but didn't dislike either. I found most products worked well or at least did their job. I really liked the body lotion the most out of this range. Looking forward to hearing others thoughts on this range and trying what else this brand has to offer. I loved the shampoo the most and the conditioner just didn't cut the mustard. I never used all products in the same morning as I was concerned that the aroma would be overpowering - though it probably wouldn't have been. The products are well designed and would make a great gift pack. They matched my bathroom beautifully (though I am one for the product than the look!). I would definitely recommend these products to others - just because the conditioner didn't work for me, doesn't mean it won't work for others. Again, as the shampoo worked great for me - will it work great for others? I was pleasantly surprised with these products. I love products with avocado in them, so I was very happy to be given the opportunity to trial the Nature Box avocado range. The range is free from silicones, parabens and sulfates, and is vegan. It is made from 100% cold-pressed avocado oil. I found everything in the range to be easy to use, and to be very moisturizing. Everything except the secret repair cream is 385ml, so is great value for money. The secret repair cream is 150ml, so it is still a decent size. The shower gel and shampoo come in green-tinted, clear plastic bottles, while the lotion, conditioner and secret repair cream come in opaque green bottles. All have black labels with Nature Box written in gold, and black pump lids, except the shower gel, which has a flip-top lid. The products are either white or clear, and all have a yummy, citrus scent. I found all the products to be gentle, and non-irritating to my skin. Altogether I really enjoyed trialling this range. Of the range, I liked the hair products best, especially the shampoo and secret repair cream. 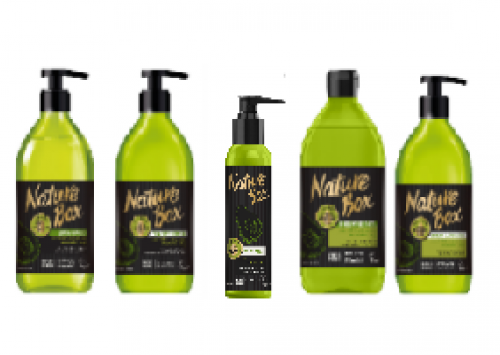 If you are looking for a gentle, non-irritating, and affordable range, then I definitely suggest checking out Nature Box. It was a pleasure to try this range. Overall, a great everyday range that is indeed moisturising and leaves skin and hair feeling good. I can't say for definite that it was repairing, I would probably have to use it for a longer time period. Where this range falls down is the very strong and 'artificial' fragrance and considering the range uses the term natural; the ingredient list reads as anything but. The body moisturiser and hair repair are the best of the range. There was good points for the range, love the packaging, the ease of application and the fact that it was made with avocado oil and vegan certified. It also, mostly did what it said but, I found the product cost a bit over the top and the smell, not overly pleasant. It's a nice range but not worth it, in my opinion.